Updated for Swift 5 and iOS 12. With NotificationCenter you can broadcast data from one part of your app to another. It uses the Observer pattern to inform registered observers when a notification comes in, using a central dispatcher called Notification Center. In this article we’ll find out how the notification center mechanism works, and how you can use it in your apps. As you’ll see, Notification Center is particularly useful for getting data from one part of your app to another. The NotificationCenter class used to be called NSNotificationCenter – with the “NS” prefix – prior to Swift 3. You’ll often find people still referring to it as NSNotificationCenter. 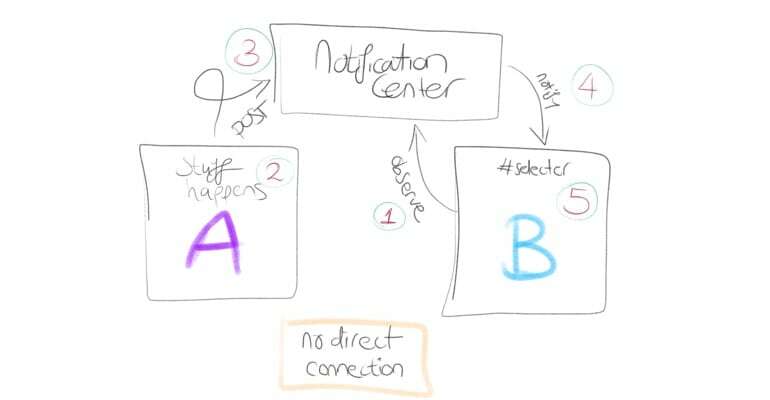 The NotificationCenter mechanism has nothing to do with push notifications or the Notification Center UI, an overview of app notifications as found in iOS and macOS. This guide solely focuses on using NotificationCenter to send in-app broadcasts with Swift 4. The cool thing about this mechanism is that Bob and Alice don’t need to know each other, they only need to “know” the central command – the NotificationCenter. Also, the Notification Center can handle one-to-many and many-to-many communications. Alice can send stuff to Bob, Arthur can send stuff to Bob, and if Alice is listening in, Bob and Arthur can also send stuff to Alice! Component A and B can be any kind of class, such as a view controller, a custom API class or a data model. Makes sense? Let’s move on! This adds an entry with those parameters to the Notification Center, essentially telling it that self wants to observe for notifications with name .didReceiveData, and when that notification occurs, the function onDidReceiveData(_:) should be called. It’s smart to think of the observer and the selector as the target and the action. What function, a so-called selector, do you want to call on what object, a so-called observer, when the notification occurs? Note: In Objective-C, a selector is a type that refers to the name of an Objective-C method. In Swift, we just call it a function – although there’s a nuance. You define the selector by typing #selector(), with the function name written within the parentheses. It’s important to use the correct selector here, including the right function parameters, so it’s easiest to use Xcode’s code auto-completion with Esc after placing the cursor in between the parentheses. Try it! The function has one parameter, which is a Notification object. You’ll see later on that you can use property userInfo to send some data with the notification. Note: You need to mark this function with @objc. That attribute makes your Swift function available in the Objective-C runtime. The NotificationCenter is part of the Objective-C runtime, so in order for it to call your function, you’ll need to add that @objc attribute. I personally often use the “did do something” or “has downloaded something” format for naming notifications, and I’m naming notification selectors similarly with “on did something” or onDidSomething(_:). 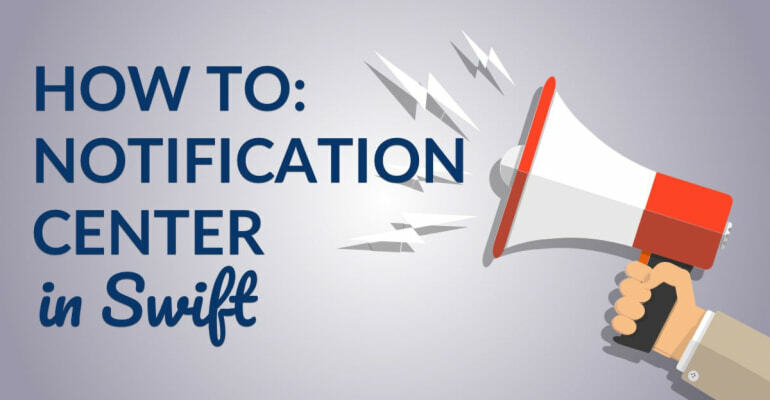 A key part of using NotificationCenter is that you register an observer before the notification you want to observe, occurs. When a notification is posted to the notification center, and you’re not observing yet, you will obviously miss the notification. By the way, the default property of the NotificationCenter is, in fact, the default notification center (duh!). All system notifications, such as UIKeyboardDidHide and UIKeyboardDidShow, are posted there. You can also create custom notification centers, although you probably don’t need to. When you need to filter notifications, use the notification name and _sender_object. You can remove an observer with removeObserver(_:name:object:) and using the exact same parameters as for addObserver(...). You can also remove all observers with removeObserver(_:). One last thing… Observers need to be removed before they are deallocated, or you risk sending a message to an object that doesn’t exist. The first parameter is name, the notification name, of type Notification.Name. It’s exactly the same as the notification you’re observing, and it’s smart to use that extension here too. The second parameter is object, the sender of the notification. You can leave it empty with nil or use any object. It’s purpose is the same as the object parameter of addObserver(...), so you can use it to filter the sender of a notification. The third parameter is userInfo, and you can use it to send extra data with the notification. The parameter is not required, so you can leave it out if you don’t need it. Let’s say you want to display some data in a table view. The data comes from a JSON webservice, and contains the game scores of Bob, Alice and Arthur. First, you’re using conditional binding to downcast the type of userInfo to [String: Int] with the type cast operator as?. Because the type of userInfo is [AnyHashable: Any]? – basically any dictionary – you can downcast its type to the dictionary type you’re expecting. That’s string keys, integer values in the example above. If the cast succeeds, then data contains the value of userInfo as type [String: Int]. Then, using a for-in loop, the items in the data dictionary are iterated. We’re using a tuple (name, score) to decompose the key and value of the dictionary items. Finally, inside the loop, we’re printing out the names and scores of Bob, Alice and Arthur. See how the scores dictionary is provided as the argument for userInfo? We’re basically sending those score data alongside the notification. They’ll get picked up in onDidReceiveData(_:) and printed out. You already know that self refers to the current instance of the class we’re in. So when API.shared references the same object as self, the notification is picked up by the observer. Let’s start by pointing out when you shouldn’t use NotificationCenter. The notification center mechanism is so simple and convenient, that it’s tempting to let any and all objects, view controllers and models communicate with it. Say you have a View Controller A and a View Controller B. You want to pass some data from A to B, when B is shown on screen. Do you use the notification center? No! It’s much simpler and clearer to use a function or property on View Controller B, like setScores(_:) or currentUser, than it is to use notification center. You might even want to use a closure, or a set a property in a segue, or just use any of the standard principles of MVC. Keep in mind to loosely couple your view controllers and/or objects, for instance by using a protocol. Want to know how to pass data between view controllers, in any scenario? Check out the extensive blog post I wrote on that topic. Imagine you have a table view controller and an API. The data from the API needs to end up in the table view controller, after it has been downloaded from a web-based JSON resource. Both classes have single responsibilities, respectively getting the data and showing the data. It doesn’t make sense to connect the table view controller to the API directly. You’re not going to add a tableView property to the API class, and add data to its data source when the JSON has been downloaded. Likewise, it doesn’t make sense to add a dataCollection property to the API class and let the table view controller use that directly. You likely want to use a datastore anyway. When another part of your app also needs to respond to new data coming in, it can simply listen in for the same notification name. This is one-to-many communication, because the one API can post notifications to many observers. When that same table view controller is used to display different data, for instance for a search feature, it can observe a different notification name or distinguish notifications by their sender. This is many-to-one or many-to-many communication, because now two view controllers are listening in on data from different sources. Finally, I think that the determining guideline for using Notification Center should be repeat and consistent use. That connection between the table view controller and the API is like an information superhighway, moving data from one part of your app to the next. Every time the user “pulls to refresh”, initiates a search, or needs new data, a signal is sent to the API to download new data, after which a notification is posted. You use NotificationCenter for repeat, consistent one-to-many or many-to-many communications. If you’re not sure, check out how to pass data between view controllers. And you can find a simple example in Xcode here.